I had grown tired of the dank damp chill of the foggy Huon Valley, and hoped that the improved weather forecast for this morning would rectify it. However, it was pretty much the same as the last few days, although I did see a shred of blue sky above at one point quite early. 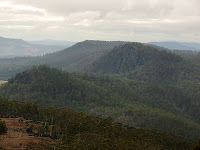 Anyway, I wanted somewhere a little drier, so I headed for Risdon Brook Dam, intending to climb Mt Direction and then head northeast-ish to see if I could find the top of Gunners Quoin. More on that latter attempt later. Mt Direction affords good views of, amongst other things, the Derwent, Hobart's northern suburbs and Mt Wellington. 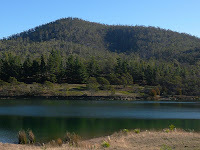 The walk starts at the Risdon Brook Dam carpark, and heads across the dam and then around the impoundment to the first hairpin bend, where you head off towards Mt Direction. You quickly join a track that rises (and occasionally falls) fairly gently as it winds across the lower slopes. After around 10 minutes on this track, you reach an intersection with another track that heads steeply uphill to the left. This is the start of the main climb. This track just climbs and winds to the top. 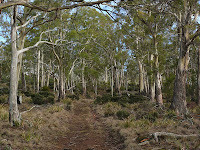 It's quite steep, and does go on for a while, but the forest is open and there's plenty of birdlife. The summit is marked by a large cairn, and there is a radio facility nearby. You have to move around a little on and near the summit to get the best views. There's a little plateau to the west which gives reasonable views of Hobart and Mt Wellington. 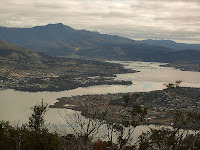 The views up the Derwent from the summit are quite spectacular. I recall being on the summit here in the 1970s (I was very, very young, you understand...) and being able to hear the cars clattering across the Bailey Bridge which was visible very steeply below. The Bowen Bridge is clearly visible these days when you get into the right position. After this I intended to head for Gunners Quoin, to the northeast of Mt Direction. There are tracks nearly to the summit marked on the maps. 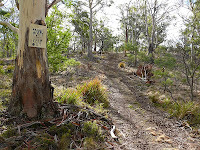 The track starts close to the top end of Risdon Brook Dam, and winds around the hills, mainly rising steadily, sometimes steeply, and occasionally falling gently for a way. I had every expectation of meeting a "Private Property, Keep Out" sign at some point, and eventually I did just as I was getting close. I am aware that the landowners around this area have trouble with motorcyclists and rock climbers who don't ask permission, so I turned around when I found the sign. Actually the walk was quite pleasant, the forest was open and airy, and when the sun came out it was a very enjoyable walk back. There are Grasstrees in groups along this track. I only found one with a flower spike. The flowering is apparently promoted by fire. I'm fairly sure these are Xanthorrhoea australis - there are three species present in Tasmania, plus hybrids. I've certainly seen the X. australis at Rocky Cape. The Wikipedia page and photos aren't instantly useful. 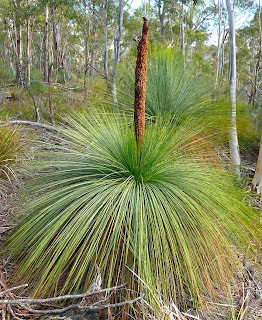 However, this recovery plan for the other Xanthorrhoea species present in Tasmania is clear that Grasstrees near Hobart are X. australis. This site is of course also close to Grasstree Hill. We have probably approached gunners from a slightly different angle and I can't recall seeing any keep out sign. It is an area that should be part of a public reserve. The sky seemed to clear first from the south today so it was nice and sunny on by late morning on Mt Wellington. Yes Peter, I think Gunners itself is a reserve, but it appears to be surrounded by non-reserve land. I know the climbers have to cross private property to get there. Do you know how you accessed it?